Pet Education: He Followed Me Home. Can I Keep Him? Before we get started, good Samaritans (GS) should be reminded that whenever they see a loose pet, they should always assume lost, not abandoned or abused. 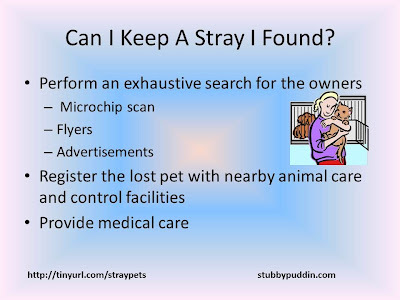 To be sure about the legal ramifications of keeping a found pet, good Samaritans should check the local and state ordinances, and consult with a lawyer. It might also be a good idea to place an inquiry at the local municipal shelter. But citizens should be aware that not all employees at the shelter will know the right answer. San Antonio's (SA) ordinances are located here. All the animal related codes are in Part II; Chapter 5. I have read through Chapter 5 several times, and I cannot find anything definitive about when a good Samaritan can keep a stray. A few years ago, SA City ordinances used to tell us that if a Good Samaritan cares for a pet for 72 hours, that pet is considered his/hers. The wording has been changed (to allow for foster care) and the limit has increased to 30 days. Note that some city employees will still cite the old ordinance. Good Samaritan starts feeding a stray and the stray takes up residence at the GS's house. Thirty-one days later, the stray bites a jogger running by the Good Samaritan's house. The Good Samaritan can be held liable for that dog bite. Let's say that the good Samaritan takes in a stray and keeps the stray in her basement for 30 days. Never gets the animal scanned for a chip, never checks lost ads, ignores lost flyers in the neighborhood, etc..
Just because 30 days has passed, does that mean that the Good Samaritan can claim the pet? I would not think so. If a Good Samartian (GS) falls in love with a stay, the GS should do everything possible to look for the previous owners and keep records of everything done. If a previous owner does show up, the GS can demonstrate his/her due diligence if the matter winds up in the legal system. After an exhaustive search, the GS should also make sure the pet is checked out by a vet, get the pet registered with the city, and follow all other legal guidelines in the legal codes. Think about it. If you lost a pet, wouldn't you want the finders to find you? 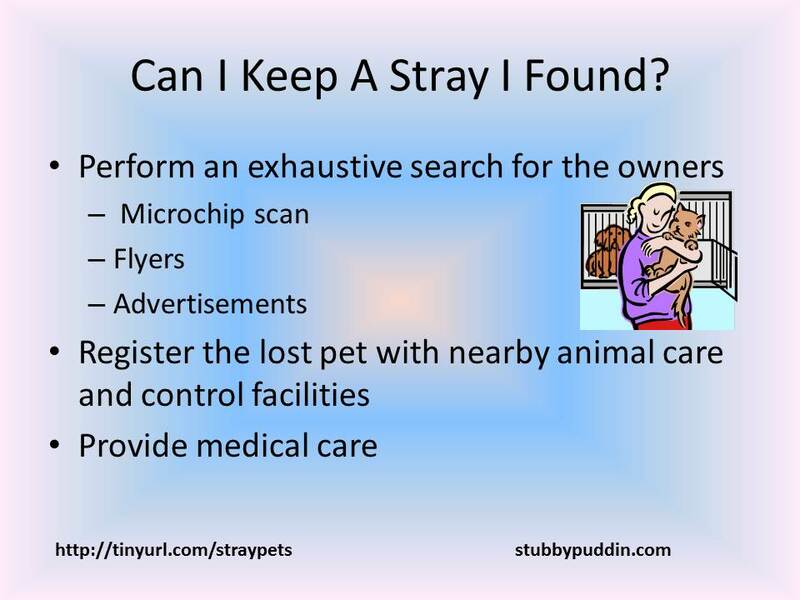 So what is due diligence when finding a stray? Post flyers or look for flyers at the city shelter. Also ask the city shelter about registering a found dog with them. Realize that dogs can travel far or they can be picked up then put back out. So You will also need a way to find owners who might be far away. Which means posting to internet sites, posting to local papers, checking nearby city shelters, etc..
Keep evidence of everything you did. Take pictures of the flyers you posted or take pictures of street corners demonstrating there were no flyers posted by previous owners. Keep newspaper clippings. How long before I can consider the lost pet as mine? So you've posted the pet everywhere and you haven't heard anything for a week? Two weeks? When can you claim the pet as your own? That is a hard question to answer. I'll provide some real life examples in my next post on this subject. I waited a month before giving up on finding the owners of the last stray that I picked up. When considering this question, Good Samaritans should be aware that the owners might be away from home and trusting a family member to take of a pet. How long before I can provide medical care? Sterilize? Also see: You've Found A Stay What Next? "Temporary owner shall mean an individual who finds a stray animal, has the animal for fewer than thirty (30) days and attempts to find the true owner of the animal. When the owner cannot be found, a temporary owner then will find a new home for the animal." The dog or cat had been abandoned or lost and the temporary owner has had the dog or cat for fewer than thirty (30) days." "It shall be the duty of every person toreport to Animal Control the presence anddescription of straying or lost animals, which appear at or take up at a person’s premise. Said report shall be made within twenty-four (24) hours after discovery of their presence"
"Any person taking up any stray domestic animal found running at large must notify the Department within four hours that they have the animal in their possession, provide a description of the animal, provide the location where the animal is being kept, and surrender the animal to the Department on demand. (Los Angeles County Code Sec. 10.36.020 and 10.36.040)"
One more note on legal issues. If good Samaritans want to be absolutely sure about claiming a pet as their own, They might consider turning in the stray to animal control, leaving the stray there for the required hold period, then going back and adopting the stray. Good Samaritans will have legal paper work showing the dog belongs to them. I found a dog that I'm willing to keep if I can't locate the owners. I think he's young - if I vaccinate him, what if he's already been vaccinated? Will the "double-dose" be harmful? Thank you so much, I'm really glad for these posts. Thanks so much for reading and thanks for the compliment. The short response to your question is that my own vet is comfortable vaccinating a pet with an unknown vacc history and most shelters and rescues vaccinate pets upon entry not knowing when the last time the pet was vaccinated. Additionally, when I pick up strays, if I can't find the owners within a day or two, I have often gone ahead and vaccinated. So basically it's been done. Another concern is that a small percentage of dogs have strong reactions to some vaccines (just like some folks can be stung by bees with no problem and some folks have serious issues). If you don't know the dog's history you won't know if you have that type of dog. If you are at all concerned about whether or not a dog is carrying a disease or if the dog is protected against disease, a couple of things you can consider. 1. Get titer tests done. Titers are normally more expensive that vaccines and more stressful for the dog (since you have to draw blood instead of doing a quick injection) and some vets aren't comfortable with titer results. They don't believe a dog is fully protected just because a titer says they are. 2. Keep the new dog separate from any other pets for 10 days or so. That way if the new dog is incubating anything, the time will give the disease time to manifest itself. Also note that proof of rabies is the law. There might be some states that allow a rabies titer instead of a rabies shot but I don’t personally know of those states. If you plan on having this dog neutered and if you plan on doing shots, I’d go ahead with shots, then neuter at a later date – so the little fella won’t have so many harsh things happening to his body at one time. You might also consider spacing the shots themselves. i.e. rabies, then a week later, Parvo, then a week later, distemper..
One more thing about shots. If you decide you want to keep this dog and the original owners show up some time in the future, you might need proof that you are caring for the dog. Some folks will meaure the amount of care by looking at vet bills. Some folks consider getting shots to be part of responsible ownership. So you migh want to be prepared to show either proof of vaccines or proof of titers. If I place an ad without a picture, can I just ask the owners to email me a picture of the found dog? I've done this on several occasions. So yes, that's reasonable to ask. But be aware that many folks keep pics in their cell phone and some of them don't know how to email from their phones. They will ask if there is a way to text the pics to you. If it comes down to that; and if you don't want to give out your number to strangers, you could purchase a 20 dollar "burner phone" to use just while you are looking for owners.